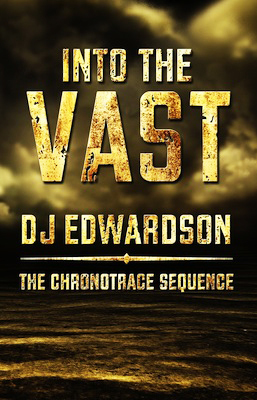 “Into the Vast (The Chronotrace Sequence)” by DJ Edwardson is not my usual choice of book but I came across it on a review website and decided to step outside my comfort zone for once. The story is about Adan, an ‘experiment’ – if you so will – in a scientific institute of a fantasy world where humans are being abducted to for mind control in the wider sense (I don’t want to be any more specific than that to preserve your own experience and discovery of this world). I was impressed at how long the author could keep the suspense and mystery of what was happening to Adan in the laboratory for so long, making me very impatient to find out where the story was going. The story follows his aided escape across the Vast to human settlements and then continues with the (occasionally literal, sometimes strategic) battle between the powers behind the institute and its enemies. Issues of trust and deception, bravery and moral principles come into play and despite really not being much of a science fiction fan I found myself compelled reading on. The characters have been set up so carefully and convincing that their personal struggles are beyond common cliques and I ended up really caring for them. The battle scenes were brilliantly done, Edwardson’s talent for description mastered this challenge effortlessly and there are enough turns and twists towards the end of the book to save it from predictability. This was a great effort, not without minor details I would personally have liked to be different, such as the made up science vocabulary, but these things come down to personal taste and would not stop me from recommending this book to any fan of the science fiction and fantasy genre. 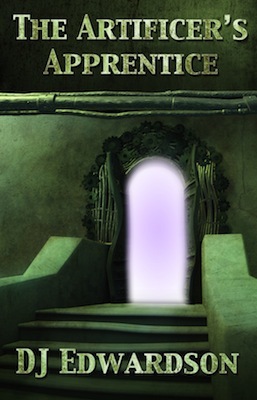 “The Artificer’s Apprentice” by DJ Edwardson is too short to give you a very detailed description and review. It is a story set in medieval times and the world of mechanical masters. The use of language is skilful and authentic to the extreme and was hugely enjoyable. The plot offers some suspense and surprises and – as often with really good short stories – it ended far too soon for my liking. Definitely a writer to watch. The long way around, I’d say. It’s one of those things where I look back and wish I’d started sooner. I always had the ideas for stories floating around in my head, and at one point actually began to write them down in a notebook, but I never really had the drive to sit down and finish an entire novel and certainly never entertained the idea of being a fiction writer as a career. Then, a few years back I joined a literature group and fell in love with books all over again. Up to that point, I had really stopped reading much, especially fiction, so I would say that rediscovering a love of story was what drew me back into writing. Why do you think you are writing in the genre of science fiction? There is an editor named Shelia Williams who said, “all fiction is written to examine or illuminate some aspect of human existence, but…in science fiction the backdrop you work against is the size of the Universe.” And I love the almost endless possibilities that science fiction affords. So, in a sense, its all about the story and the characters at the end of the day, just as it would be for any other genre. But there is another sense in which there is a deliberate effort on my part to tell a certain kind of story which is (hopefully) quite distinct. To be honest, I’m not exactly sure that science fiction is broad enough to describe it. I think “speculative fiction” might be a better term but the phrase I really prefer is “imaginative fiction”. This “imaginative” fiction is writing that lifts the reader out of the mundane or the ordinary so that he can experience the world as it really is. What I mean by that is this: we may think that traffic and work and the daily news are all “real life”, but so often they numb us to the wonder and magic of really living. We trim our nails and brush our teeth and go to the gym, but is that all there is to life? To stay relatively healthy and free from pain until we one day fall into the grave? What about things like courage, truth, sacrifice, and honour? What are our daily lives teaching us about those things? Of course I don’t doubt that some people have very dramatic experiences, but I think that for most people, they settle into life in such a way that they are blind to what really matters. And I believe there is something inherent in the way our mind works (at least I know this is true of my mind which is the one I know best) that allows imaginative stories to take us out of our daily routines and show us the glory of creation and what it means to be human. Sometimes this sort of fiction is labelled “escapism”, but Tolkien, who is one of the writers who has had a big impact on me, was not fond of the way that term was often used in conjunction with this sort of writing. “Why should a man be scorned,” he wrote, “if finding himself in prison, he tries to get out and go home?” While I don’t doubt that there are many speculative stories (or romance or other genres for that matter) which are designed merely to make you forget the monotonies of life and give you a sense of excitement, that is not what I am talking about. This kind of escape is not from reality, but into reality. And the best of these stories raise us out of our limited, temporary perspectives and bring us into a larger, wider country where we are free to see things as they really are. On such a journey, we have the possibility to grow along with the characters we meet and, if the story has really done its job, to bring back a little piece of that distant land with us when we return. I think G.K. Chesterton put it beautifully when he said, “Fairy tales are more than true; not because they tell us that dragons exist, but because they tell us that dragons can be beaten.” And I hope that is emblematic of the kinds of things I write. When did you first have the idea for “Into the Vast” and “The Artificer’s Apprentice”? Well, remember the notebook I mentioned? That was really the genesis of the story which later became “Into the Vast”, though it morphed quite a bit over time into what it is today. I actually wrote about fifty pages of the story in 1995 but I don’t think any of that survived into the final version. As for “The Artificer’s Apprentice”, the idea for that story came to me while working on “Into the Vast”. I keep a folder of ideas for other stories and, in between drafts of the novel, I decided to take a little break from the book and sat down and wrote a few short stories. The Artificer was one of those stories. How long did it take you to write them? 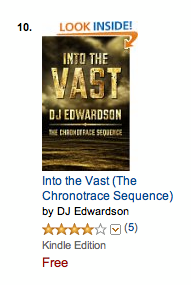 I suppose if you counted from when I first got the idea for “Into the Vast” you could say it took about 17 years! But in actuality, I only began to seriously work on the novel about three years ago. However, the final bits like the cover, web site, and other marketing things took some of that time so perhaps the writing part was finished after about two and a half years. As you might imagine, “The Artificer’s Apprentice” took much less time. When I write short stories they usually come out in one big rush and that story was more or less complete after about a week. That’s one of the advantages of writing short stories, you have this wonderful nugget and it takes so little time. But there are challenges as well, of course, and most of my ideas seem to be more of the novel-length sort. How do you decide when to write a short story and when to turn it into a book? Great question! I’m not sure I have a definite answer except that I try to stop writing when the story is finished. For instance, I’ve actually written the first draft of another novel that is not yet published and that one began in my mind as a short story. But as I got into it I quickly realized that there was much more there than I had originally supposed and so I just kept writing and writing until I had a full-length novel. How comfortable do you feel writing about a futuristic world and imaginary technology? Another great question. You know, I’m not a scientist, I’m a writer, but there is sort of this tension when you’re writing about the future in which it needs to be based on what is currently considered plausible or at least have the air of plausibility to it. And yet, when I look at science from a historical perspective, it’s forever being rewritten and correcting itself and getting it wrong, as it were. It’s really a work in progress. And so two hundred years ago, I don’t believe they were talking about quarks and DNA and relativity and so forth. Given this constant state of flux, I wondered if it was reasonable to assume that one hundred years or five hundred years from now we will be using the same concepts and paradigms. Certainly there may be some similarities, some common threads, but who can say what those will be and I imagine a great deal of it would seem utterly foreign, perhaps even irrational, if we were to be exposed to it today because we simply aren’t accustomed to thinking that way. So my approach was to try and make the scientific and technological elements on the one hand radically different from current science and at the same time, at least plausible. Some of it is actually based on current scientific trends like cloning and organic computing, but I never use those terms because I don’t want the reader to fall into thinking they are the same exact thing and expecting them to function in a certain way. It is much more important that he have a sense of wonder and discovery and the realization that this place is vastly different from our own time, that we’re “not in Kansas anymore,” as it were. I do hope, at the very least however, that the technological and scientific aspects are consistent within themselves. As a writer, I think that is the real test. Given that X exists and can do Y, how does that interact with Z and does it do so consistently within the given framework of that world? I write on a laptop and use a wonderful application called Scrivener. If you haven’t tried it and if you’re at all inclined to write on a computer, I would highly recommend it. On the surface it doesn’t seem so different from a regular word processor and it definitely takes some getting used to, but at the end of the day it allows me to organize my work into chapters and scenes much more intuitively and I can keep all my notes and timelines and outlines into one, integrated program. I can’t imagine writing without it now. Also, writing on the computer has the advantage of never being without music. I always write to instrumental music, usually soundtracks from movies and that really helps me get into the feel of what I’m writing. I did six separate drafts for “Into the Vast”. And three of those were what I’d call “full” re-writes by which I mean cutting scenes, re-writing chapters, changing character’s actions dramatically, and in general wreaking havoc on the plot. The other three were more for copy-editing and cleaning up the text, though I did do some restructuring in those as well. I have read many great books that no doubt have played a part in my formation as an author, but in terms of overall influence and just the admiration that I have for them, there are two authors that really stand above the rest and they are J.R.R. Tolkien and C.S. Lewis. Of course, I love their books, but really it was some of their essays, in particular, “On Faerie Stories” by Tolkien, and “On Stories” by Lewis that really had the most impact on my trajectory as a writer. Before reading those, I had this love of story but I really couldn’t define it. It was rather vague in my mind and I wasn’t entirely sure what I was going for. These two great authors helped me see the path ahead more clearly and understand why story was so important to me as a writer. Hmm, I suppose most authors do imagine what their book would look like up on the big screen. I actually did some stage acting back in school and have seen my fair share of theatre over the years so I like to think I have some sort of an eye for this sort of thing, but in reality I’m sure the production companies don’t really seek an author’s input much when it comes to casting. All the same, it’s a fun question so I’ll take a stab at it. I think for Will, there is an actor named Eduardo Verastegui who is more well known in the Hispanic world, though he was recently in the film “For Greater Glory” which was released in the states. I really think he has that sort of intense look to him that I imagine Will would have. For Gavin, who in some ways is a bit conflicted and sort of struggling with his past, I think Richard Armitage might work. He played a very intense Thorin Oakenshield in “The Hobbit” and again, he sort of just looks the way I pictured Gavin would look. Senya, though she only appears in one section of the book, is a very important character and I would want someone who could appear both tender and strong to play her role. I think Lynn Collins, who was in “John Carter”, would be able to pull that off. The main character, Adan, would be the hardest for me to cast because he’s sort of this ‘everyman’ in my mind so he literally could be anyone. I think, though, that Drew Fuller who did a great job in the film “The Ultimate Gift” of portraying this sort of vulnerable, uncertain person who eventually grows into a strong character might do the trick. Well, I think that covers the main characters. Great questions all around, and thanks so much for interviewing me on your site!